Above: Eyjafjallajökull volcano erupting, 21 March 2010. Detail of screen capture from this video (thanks go to Boris Behncke for the link). Eyjafjallajökull volcano in southern Iceland has erupted after an extended period of seismic restlessness. The volcano began to erupt around midnight local time 20/21 March 2010. Civil protection authorities report that no-one is in immediate danger, but between 500 and 600 people have been evacuated from their homes. Pictures and reports indicate a fissure eruption; lava flows and ashfall have been reported and roads have been closed. University of Iceland geologist Tumi Gudumundsson is quoted by ABC News as saying that the eruption is located beneath an ice-free portion of the volcano, lessening the chances of a glacial flood being caused by melted ice. This could change, however, as the eruption develops. London VAAC issued an advisory at 0600Z reporting that the altitude of the eruption plume is currently unknown but is below FL150 (15,000 feet/4500 metres). The Icelandic civil aviation authority (Flugstoðir) has issued a NOTAM for the eruption, airports have been closed and incoming flights have been diverted away from Icelandic airspace. Egilsstaðir airport in eastern Iceland is the only Icelandic airport currently open, reports The Daily Telegraph. 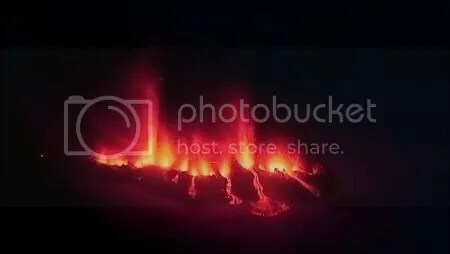 Icelandic news site mbl.is (the Morgunblaðið newspaper) has some pictures of the eruption (H/T: comment from Korf at Eruptions). And some more very nice images here showing lava fountaining along the fissure (H/T: Boris Behncke at Eruptions, who also provides a link to this video – screen capture above). UPDATE: some English-language news reports from Iceland Review Online. Geophyicist Freymódur Sigmundsson describes the eruption as ‘stable’ and ‘impressive’ after a three-hour overflight today, and observes that the rift is very close to the edge of both Eyjafjallajökull and Mýrdalsjökull and does not currently threaten to cause a glacial meltwater flood: ‘It is possible that the eruption moves south or north. If it goes south it could go under the glacier, but we have no indication of that’. The BBC News report on the eruption has been updated with comments from Pall Einarsson of the University of Iceland Institute of Earth Science: ‘This was a rather small and peaceful eruption but we are concerned that it could trigger an eruption at the nearby Katla volcano, a vicious volcano that could cause both local and global damage’. The Eyjafjallajökull-Katla connection needs careful watching. UPDATE: more coverage at Eruptions – The 2010 fissure eruption at Eyjafjallajokull. Great blog you got here dr. Erik Klemetti. I just wanted to send you this video link from last night, the coast guard of Iceland flew to Eyjafjallajökull and took those great video. there was a short lived stream/ ash explosion this morning. The ash or steam explosion reached 8 kms high. the fissure is 2km long now. I Was reading a article about Dr. Erik and there was link in that article to this webpage and I thought this blog was his. Still great blog you got here…..
No worries, and thanks, Atli – I’m flattered by the mistaken identity! Hér má horfa á myndskeið sem tekið var austan við Hellu í morgun. Just came across the Morgunblaðið home page – http://www.mbl.is – and there is a nice closeup photograph of one of the new cinder cones growing on the active eruptive fissure. you can see how the active lava front drops into a steep gorge, and I am convinced that’s where the phreatomagmatic explosion took place. When there is somewhat turbulent mixing of lava with snow, this leads to fuel-coolant interactions, that is, phreatomagmatic explosions, and this can even generate small pyroclastic flows. We’ve seen this on Etna, especially in March 2007, when a lava flow first travelled over gently sloping terrain without generating explosions although it cut into snow about 10 m deep. But when the lava flow reached a steep slope, still deeply covered in snow, violent explosive interaction would start, generating a plume several kilometers high. I guess that’s what created the somewhat larger explosions seen this morning. Nothing to do with the vigor of the eruptive activity at the vents, it’s a secondary explosive process. Many thanks for all that information, and for the explanation of the phreatomagmatic activity, Boris (and for the welcome). Bu kadar amcık bir yanardağıda olmaz arkadaş.Sen 190 yıl bekle manitayla buluşacağım gün patla..Lav dökdüğüde yok gavatın yalandan duman salıyor göt oğlanı.